I've worked on books in three different series, with three different settings, in the past few months. This post is a reflection on how the writing experience differed between them, and how the settings contributed to the stories I told in them. The three series are Auckland Allies (contemporary urban fantasy, set in the city where I live); Hand of the Trickster (sword-and-sorcery heists); and the Gryphon Clerks (secondary-world lightly steampunked fantasy). Yes, I know my last post said I probably wouldn't be working on any more Gryphon Clerks stories in the foreseeable future. The future is a lot less foreseeable than I thought, as it turns out. Part of the reason for having different series going is that a change is, in fact, as good as a rest. Because they feel different to work on, I can work on one when I don't feel like working on another, and switching from one to another can be refreshing. In fact, the reason I got out my abandoned manuscript of Mister Bucket for Assembly, the Gryphon Clerks novel (which turned out to be about 75% complete), was that I was making slow, difficult progress on the second Hand of the Trickster book. I was soon happily logging 3000 to 5000-word days on Mister Bucket, where I'd struggled to reach 1500 words some days on the other book. Let's see if I can identify what it is about each of these series that feels different, what attracts me to write in the settings, and what those settings contribute to the fiction. The fun thing about Auckland Allies is that it takes place in a setting I know well: the real-world city of Auckland, New Zealand, where I was born and, where, apart from an eight-month period in Brisbane many years ago, I've lived ever since. That means that I can celebrate the things I enjoy about the city; work in a few complaints about it; and research my books just by walking around (or using Google Maps and Street View, in a pinch). It also provides its own inspiration. For the first book, I strapped a GoPro camera to my head and walked through places where I'd set chase scenes, and that gave me additional ideas for those scenes and how they could go. I also used the extinct volcanoes which are a unique aspect of Auckland to make it a story that couldn't be set anywhere else. The second book, Ghost Bridge, is almost entirely inspired by real aspects of the city, in fact. There really is an early-20th-century bridge which sits partially over a 19th-century graveyard, close to the downtown area. There really is a hospital at one end of the bridge and a luxury hotel at the other. Four thousand graves really were dug up when the nearby motorway went through in the 1960s, and the bodies really were cremated and reburied in a mass grave next to the bridge. And there really is a statue of Zealandia, the personified spirit of New Zealand, a short distance down the road. All of these are key elements of the story in Ghost Bridge; in fact, if you took them away, there wouldn't be much story left. And I didn't have to make up a single one of them, only take what was there already and combine them imaginatively. The other fun thing about Auckland Allies is that I can write in my own dialect. A lot of the time, I'm writing with an eye to the American market, since that's the largest market for fiction in English, and I have to be aware of phrasing things in a way that will be clear to American readers, not using turns of phrase or slang that come naturally to me but would sound strange to them. In Auckland Allies, I'm writing characters who are explicitly New Zealanders, and they speak accordingly--not only in their dialogue, but in their narration, since I use first person points of view. I'm still aware of the language, and still careful to phrase things so that someone who isn't familiar with the slang will nevertheless understand it from context--something that, as a science fiction and fantasy author, I have practice at doing--but I enjoy being able to write in a full-on Kiwi voice, rather than in intentionally bland international English. Hand of the Trickster is my newest series, so new that I've only just published the first book. So far, I have a 34,000-word novella (the one that just went up), and 26,000 words of what looks like being a shortish novel. Accordingly, the setting is less developed so far than in the other two series. It's sword-and-sorcery, set in a world of many gods. The High Gods have become distant and uninvolved since the War of Gods, leaving their followers to (mis)manage the Empire, but the Middle Gods are still at large in the world, especially the Trickster. One thing I enjoy about this setting is that not much is really nailed down yet. I'm making it up as I go along, rather than planning it out in advance (like the Gryphon Clerks) or conforming it to the real world (like Auckland Allies). I haven't even drawn a map yet. While that results in a setting that isn't as rich and complex, the focus is more on character and plot; the setting, apart from the situation with the gods, doesn't drive the story as much as in the other two series. Having a main character who's a thief in the service of the Trickster also enables me to let my chaotic side out to play. I've met a couple of real-life fraudsters, and they were extremely annoying; but I love fictional heists, capers, and shenanigans, and this is my chance to write some. I identify as neutral good with strong lawful leanings, but writing a chaotic good character like Now You Don't (the protagonist and narrator of Hand of the Trickster), or like Sparx, the hacker technomage in Auckland Allies, is tremendous fun and gives the mischievous part of me a safe outlet. My father always enjoyed playing villain roles in light opera, for similar reasons. The Gryphon Clerks setting was originally intended as a game setting, but I never finished the game, and the story seeds I kept planting became too tempting. I mapped out a geographically large and culturally detailed and diverse world, with room for a great many stories, and in fact I find that the stories multiply as I write them. This is partly because lots of minor characters tend to be needed for the kind of large-scale stories I tell there, and they turn up and become unexpectedly interesting, and then I want to write more about them. In the book I've just finished drafting, for example (Mister Bucket for Assembly), near the end of the book three young gnomes are running a small newspaper and what amounts to a radio station. They're secondary to the main action, but now I want to write a novel all about them as they build their media empire, bicker, fall in love, break stories, witness history and struggle against the odds. This is how the world tends to expand, one story at a time, and there's a whole huge area beyond the mountains that I haven't even visited yet. I said above that I worked out the setting in advance. I didn't work out everything, though. As I write each book, I add to a wiki which holds all of the established facts about the world, so that I don't end up contradicting myself. Sometimes, this sparks further ideas; occasionally, it means I can't do something because of something I've already said, and I have to rewrite. This generally ends up being a useful creative constraint more than an annoyance, though. What is a bit of an annoyance, in retrospect, is that I've made the setting almost science-fictional, and used some different terms for things that we already have names for, like marriage (which I call oathbinding), in order to underline the differences from our world. I've also used an approach to character names that not everybody loves. I'm kind of stuck with those things now, even though they can feel awkward at times. People who love the setting and the characters seem willing to forgive me, though. When you're writing fantasy and science fiction, in particular, setting is very important as a story driver. Not only does it determine what stories are possible, but it suggests what stories might be interesting. My first published novel, City of Masks, was stalled for about 10 years because, having got the protagonist to the setting, I couldn't figure out what happened next. My creative block was freed when I made a large diagram of conflicting factions in the city and tied characters to them. Each group, and therefore each character, had its own agenda, and this set the story in motion. I've not, so far, thought of another story in that setting, but if I ever do it might well be driven by a similar spring. Certainly, clashing interests in the respective settings drive the plots of Auckland Allies, Hand of the Trickster and the Gryphon Clerks, in different ways that I've attempted to explore above. While immersing deeply into just one world and writing a series, or multiple series, set there has proved a productive and lucrative approach for many writers, I find that variety helps me to stay fresh, and that my different settings have unique elements that make each of them fun in its own way. I hope that my readers find the same. "Release schedule," listen to me, all highfalutin'. But I do have a few things coming out this year. I'm not sure when, but sometime soon In June, Cosmic Roots and Eldritch Shores will be publishing my story "Gatekeeper, What Toll?" (accessible by subscription only). It boils down a multi-volume epic fantasy series about a fated tragic hero to the essential 0.1%, by filtering it through the eyes of the keeper of a gate between worlds. Also in June, Farstrider published my story "Mail Order Witch". When Jim kind of semi-accidentally steals his buddy Bill's Russian bride, things don't go so well. 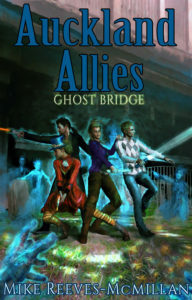 Auckland Allies 2: Ghost Bridge is all ready to go at the beginning of June. I'll be running a promotion on Book 1 as part of that launch, so stay tuned. The contemporary urban fantasy/technothriller action continues as the Allies face a necromancer raising ghosts from a Victorian cemetery near the heart of the city. Steampunk Sally, I have to say, is awesome in this one, both when she pulls off a grift over the phone and when she... No, I won't spoil it. Put it this way: if you thought it was cool when she hit a guy with a weaponised possum, you'll really enjoy this. I've just finished a sword-and-sorcery novella, Hand of the Trickster. It features a thief who's been blessed by his patron god, the Trickster, with the ability to "conjure" small items to and from storage in the Trickster Temple. He teams up with an ex-priestess of Wisdom, who's done something unwise; a huge man with a steel scorpion amulet embedded in his chest that makes him invulnerable; and an illusionist grifter with a warped sense of humour. Together, they pull heists on the temples of Wisdom and Justice. Update: All going well, there will be a second book in November. Update: Now complete, and scheduled for September. I'm part of a cool project that I don't think I'm supposed to talk about yet, so I won't. But it features some authors whose work I admire, and an audacious attempt to... no, I've said too much. My science fiction story "Taking Pro" will appear in Futuristica 2 from Metasagas Press. I read the first volume of this anthology series recently, and there are some excellent stories in it, so I look forward to the second one. My story is about what happens when scientists come up with a treatment that turns people "prosocial", and how they face the ethical and political dilemmas that engenders. I have about 36,000 words' worth of short stories and an 18,700-word novella out on submission at the moment (counting the novelette that forms the first third of Hand of the Trickster), and hopefully at least some of that will sell at some point this year. I also have three more stories that I've already sold, but I haven't been told when they'll be published (some markets communicate better than others). I'll let you know as things develop. Thanks, by the way, to those who voted for my story "Something Rich and Strange" in the Sir Julius Vogel Award nominations; it didn't make the final list, but as you can see, there will be plenty of material for nomination next year. Around 150,000 words of it, if I've counted right. Wow. 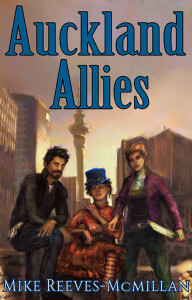 I'm pleased to announce that the first book in my new urban fantasy series, Auckland Allies, is available from Amazon (other outlets to follow soon). As bit players in the world of magic, Tara, Sparx, and their clairvoyant acquaintance Steampunk Sally are careful to stay clear of New Zealand's supernatural politics. So after Sally uses her powers to win a little money at blackjack, it's a nasty surprise when hired goons come after them. Hitting the streets, they try to find out who these Blokes in Black work for, why such a dangerous and powerful figure has his sights set on three magical nobodies--and how to protect themselves. They discover a plot to use Auckland's volcanoes in a massive demon-summoning ritual, which nobody else is equipped to stop. The question is: are they? I have six more books at various degrees of "planned" for the series. I've already started on the second book, Auckland Allies: Newtonian Manuscript, in which a magical text by Sir Isaac Newton, a nonmagical ex-girlfriend, and a necromantic threat all interfere with Sparx and Sally's attempt to make a living supplying costumes and props to New Zealand's film industry. This is going to be more of a "continuing story" series than the Gryphon Clerks' "meanwhile, elsewhere" approach. Each book will build on the previous one, but be complete in itself, with the first chapter or two reminding or informing readers who these people are and why they're all fighting. Early feedback indicates that this is a solid, fun novel with good potential for a series, and I'm excited to see how it goes. Pick up your copy from Amazon. My Short Story Challenge project is going well; so far this year I've made 42 submissions (only two short of 2014's full-year total), and had seven acceptances, which I'm super-happy about. Most of the acceptances have been recent, so the only one published since my last update is "Lock and Key," in which a clever alchemist in an Arabian-Nights setting solves several murders. All the details of my short story sales and where they will appear are on the short stories page at the website. Coming very soon is In Memory, a tribute anthology to Sir Terry Pratchett in aid of Alzheimer's research, in which I have a piece. Next year I hope to write at least two dozen stories, so if you like my short fiction there's plenty more coming. And if novels are more your speed, make sure to pick up Auckland Allies. I don't have a launch date yet - I've just today finished the first draft - but, after appropriate revisions, Blokes in Black will be on its way to you very soon. As minor practitioners, Tara and Sparx are careful to stay clear of magical politics. So they're not expecting the anonymous goon-o-gram from a more powerful talent, who's apparently miffed with their acquaintance Steampunk Sally, the short-range seer. Fighting off the attack with a combination of dumb luck and reluctant teamwork, they set about finding out who the Blokes in Black work for, and why they might be targeting three underpowered makers in Auckland, New Zealand. I tell the story through three first-person narrators (Tara, Sparx and Sally), because I couldn't just leave the formula alone and write an urban fantasy like all the others. However, it's still very much in the mould of the urban fantasies I love - Carrie Vaughn, Jim Butcher and Patricia Briggs. My Gryphon Clerks novels have been criticised for sometimes lacking conflict, tension and emotional engagement, and I've listened to those criticisms. I don't think you'll find those problems here. It's set in Auckland, New Zealand, where I've lived basically all my life, so it's an opportunity for me to write about places and things that I know and (in most cases) love. The title is a tribute to my late father, who co-wrote a very successful nonfiction book about New Zealand rugby called Men in Black, and the language and setting are unashamedly Kiwi. I'm having huge fun with this book, and I hope you will too. Make sure you join my (low-volume) mailing list if you want to be informed when Blokes in Black comes out. UPDATE: It's out (now called Auckland Allies), and so is Book 2 in the series, Ghost Bridge. I've been writing the Gryphon Clerks series, which is secondary-world fantasy, for a while now. I did a lot of worldbuilding for it upfront (originally, I planned it as a game setting, but it kept generating stories, and games are hard). It's very much a distinct world, with a lot of specific differences from our world that I have to keep in mind when I write. For example, there are no pigs, and no New World plants or animals. The calendar is completely different. The counting system is different. The way society is structured, the names for common things (even marriage)... I have to keep constantly alert to avoid breaking my own canon by writing sentences like "She got married last month". One of my projects this year is an urban fantasy. I've written the first chapter and done some planning of things I'd like to include - one of them is an action set-piece that takes place along the route I walk to work, which will be great fun. But, while it seems like urban fantasy would require a minimum of worldbuilding, there are actually a number of questions that I have to ask myself about the world, and that any urban fantasy writer has to answer, even if only by implication. I thought I'd work through them in a blog post, so that other people could see my process. I'll use some of my favourite (and one or two of my non-favourite) urban fantasy series as examples, and I'll make my decisions based, in part, on what opportunities it offers me for setting up conflicts and developing a series over time. The term "masquerade" (in this context) comes from the game Vampire: the Masquerade, in which it means the conspiracy by which the vampires conceal their existence from the world at large. One of the key questions of urban fantasy is whether people in general know that magic, the supernatural, and/or the various races (vampires, fae, werewolves) exist. In Jim Butcher's Dresden Files, so far at least, they don't know (though it's largely through natural human rationalisation, rather than any particular conspiracy, that they remain ignorant). In Carrie Vaughn's Kitty Norville books, they do know, as of early in the series, and Kitty was involved in the outing process (not by her choice). In Patricia Briggs' Mercy Thompson series, we have a middle ground: werewolves are out, fae are out, but vampires remain unrevealed to the populace at large, and everyone wants to keep it that way to avoid a panic. One of the consequences of this question is that if the existence of the supernatural isn't common knowledge in the world, preserving the secret - or, alternatively, the secret coming out - may become a plot driver. A series can even be partly driven by successive outings, as the Mercy Thompson series is. If the supernatural is out, on the other hand, that's a difference from our world, and we need to think about the consequences. In the Kitty Norville books, for example, there are people (often religious) who see the supernaturals as inherently evil and to be destroyed. There will generally be a government response (this can exist even where the secret is hidden from the population at large, of course), and government agents from an agency that deals with the supernatural are likely to show up and do what government agents do. The main character may even be a part of such an agency. Since scientists tend to write hard SF rather than urban fantasy, the scientific study of the supernatural tends not to be a huge emphasis, though in my opinion it would be a big consequence of open, undeniable supernatural phenomena. There are sometimes sinister labs which want to vivisect the characters, but there isn't a lot of in-depth "this is what it's like to be a scientist in a world where there's magic", probably because that's complicated to work through and risks the fragile suspension of disbelief that you're working hard to create in the audience. I'm noting that as a potential avenue for future exploration. I can imagine a scientist in a world where the supernatural exists, but isn't public knowledge, coming across unambiguous supernatural phenomena and being torn between wanting to study and understand this fascinating new thing, and the knowledge that attempting to publish any findings will probably end his or her career. Because that seems like a cool idea, and because starting with the supernatural hidden gives more scope (after all, I can always have it come out later, whereas I can't start with it out and then later have it be hidden), I'm choosing to make my world one in which magic exists, but isn't generally known or acknowledged. If magic, the supernatural, or whatever exists, has this always been the case? Or is it a recent emergence (or re-emergence)? And if it's always been there, why isn't it generally known? In some series, like Ilona Andrews' Kate Daniels, magic has started up relatively recently, as part of a more-or-less apocalyptic event. In most, though, magic has always been there. Kim Harrison has a dollar each way, and has her apocalypse kill off a lot of normals so that the magicals are now a substantial enough majority that they feel safe coming out (though they were there all along). To me, if magic has always been around, you need to give at least some thought to a secret history of the world in which magic featured significantly in historical events, and also to historical practitioners of magic. Most urban fantasy magic is more or less made up wholesale, or based on modern "witchcraft" or New Age practices (but I repeat myself). There's a long and fascinating history of real-world attempts at magical practice, though, and it seems a pity to throw it all away (particularly since I know enough about it to fake my way through it in a manner that should convince most non-experts, which is as much expertise as I care to develop). Here's my decision, then: magic has always been around, always been a human potential, but the ways in which it was done historically were flawed or simplistic in similar ways to how, say, chemistry was done in the same periods. People were able to achieve useful effects, but without really understanding why things worked, and sometimes they put things into the process that really made no difference, because of that lack of understanding. As of relatively recently, people started getting good at magic (ironically, because of a more scientific mindset, in which they set out to understand why things worked through an experimental process). However, there's still not a comprehensive theory. It's more like magic's early 19th century than its 21st, and it's more engineering than science. One of the things that enables is that magic use itself, not just the characters' ability to use magic, can grow and develop in the course of a series. They can come up with new ways of doing things that nobody has ever thought of before (and that the author didn't think of earlier on, even if they would have been handy - in fact, the earlier problem that could have been solved by a particular bit of magic can be the stimulus to develop that solution). Most urban fantasy series have a static magic system, already as good as it's getting, so to introduce a new thing involves introducing a new (usually) antagonist who's a different kind of fae or whatever. Jim Butcher's Dresden Files spends the first few books setting up the many different supernatural beings in his world. Wizards, werewolves, vampires, ghosts, fae, the undead, and the Knights of the Cross/Order of the Blackened Denarius each get a book, and for a while they rotated, so we'd get a book in which the werewolves featured (but not the fae or the knights), and then one in which the knights featured (but not the werewolves), and so on. These days, he's mixing them up more. This makes for a rich world, but it's a lot to manage. Some series just have a bunch of diverse fae. Others are all vampire, all the time. It's unusual to have werewolves (or other shifters) without vampires, but I'm sure it's been done. Alternatively, you can have just one supernatural, like the djinn in Rachel Caine's Weather Warden series (arguably, the Wardens are a second kind of supernatural, in that they're humans who can work with the djinn). At the same time, I do have an idea (which probably won't go in the first book) about what the demons/angels are that medieval and renaissance European magicians were summoning and talking to. At least, I have an idea for a theory that a character has, a theory which may well turn out to be mistaken. And I don't guarantee that there won't be lycanthropy spells (that don't cause physical transformations, only mental ones), or entities that feed off others that are hosted by humans, give them superhuman abilities, and are transferred by feeding, but are totally not vampires. As for the fae, I tend to think of them as extradimensional aliens anyway, and while at the moment that's not an idea that I'm excited about for this setting, I'm not ruling it out. Can anyone, more or less, learn to do magic? Or is it something you're born with or without? J.K. Rowling's Harry Potter series is one in which the inherited ability to do magic is a significant plot driver, because it's a basis for discrimination. There are "muggles", who have no magic, can't see it, can't do it. There are wizards and witches, who have magic and can do it. But there are "muggle-borns", whose parents aren't magical, but they are; and there are "squibs", vice versa. I'm sure someone has worked out the genetics somewhere. (Yep, sure enough.) In Mendelian genetics, an offspring either does, or does not, have a simple heritable trait (there is no try), but most significant human abilities, like intelligence, involve multiple genes. Even eye colour does. Most fantasy (urban or secondary-world) that involves magic, in fact, assumes that there are magical haves and have-nots, and vaguely indicates that this is somehow based on genetics. I like to use the parallel of musical ability. Some people have none at all (though they don't always know it, as American Idol auditions prove every year); some have enough to sing in tune in a choir; some are musical geniuses. It's heritable (nearly 50%, which is very high, according to this article), improves with certain kinds of training, and so forth. Because it's so heritable, it's presumably getting more common in the population over time, as well - any geneticists want to correct me on that one? This excellent post on statistical patterns by Yonatan Zunger suggests that a biologically-based ability will usually form a power law: there will be a few people with a lot of it and a lot of people with a little of it, and a fairly steep drop-off between the two. Right there, you have a have/have-not situation, with a few powerful people and a lot of lesser talents, and this is a great setup for conflict (and you can use it as a political metaphor, which I happen to think is cool). And as part of the trope-aversion part of my project, I'm not choosing, as my main character, one of the super-powerful, exceptional people, but someone further down the slope of the curve, who has to work damned hard and apply a lot of intelligence to survive in a world where there are people a lot more powerful than she is. So, How Does Magic Work? There are several parts to the "how does magic work?" question. There's the sciency part, which at the moment for me is a vague and handwavey "human consciousness meshes with the quantum mumble mumble and look, over there, a squirrel!". This should be sufficient to get an urban fantasy going; most urban fantasy series never even address the question. movement of matter - so telekinesis, etc. As it happens, those (plus time and space, which I haven't really played with yet) are more or less the categories of things that magic can affect in my Gryphon Clerks novels, so I'm clearly going to have to re-skin it. Which leads to the last version of "how does it work? ": "what does it look like?" Remember, we're at a kind of early-19th-century-science level of understanding and use of magic. There's a history and a tradition. And magic works by the human mind interacting with the structure of the universe, so magic tends to work best when you use your own system of symbology, whatever that may be. Some people use a very precise, structured, traditional set of symbols, though most magic users realise that the traditional methods are full of unnecessary flounces. Some draw only on one symbol set; others are more pick-and-mix. Essentially, magic consists of ordering your will and mental effort in such a way that it will produce the desired effect (and only that effect) in the world, by whatever means works for you. Some people's magic is sloppy, and has unintended side effects; that's also likely to happen if you cast on the fly and in a hurry. Some can produce a wide range of effects, while others can only do a couple of reliable spells. Some people make up their own spells (they're like cooks who create their own recipes), others can only work from an existing spell, or with a pattern that's been laid out for them in some object - I suppose that last one is like making a meal from a packet. So, what's the story going to look like? What characters fall out of that setting? Tara is an artist who creates magic items for other people to use, working with Celtic design elements. Sometimes, the way that they use the items causes problems for her. This is the situation in Chapter 1: some more-powerful magic user is about to send her a goon-o-gram about how annoyed he is with one of her customers. Tara's friend/sidekick/cotagonist/definitely-not-love-interest, Sparx the electromancer, does something similar to her in a completely different way. He has very little raw power, even less than she does, but has learned to use it precisely to create complex effects. Warned by one of his clients about the hit on Tara, he warns her in turn, and helps her to deal with the attacks. The third in the trio, Steampunk Sally, has a minor talent for seeing a few seconds into the future (magic sometimes throws up these oddities) - and a reckless nature which tends to get them all in trouble, because, despite her ability, medium-term consequences tend to elude her in her decision-making process. She's the client who has caused the issues for Tara. My current draft of Chapter 1 is here. Want to be kept informed about progress on the book, and when it will be available? Sign up in the sidebar (make sure to leave "Occasional blog posts" checked).